After leaving Fox Glacier and the reflection of Mt. Tasman and Mt. Cook in Lake Matheson, we drove on Route 6 in the direction of the West Coast, facing the Tasman Sea. 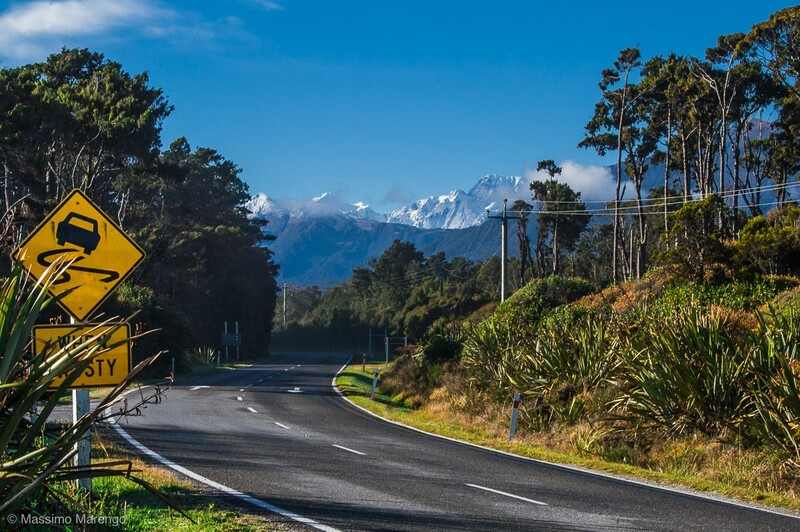 The road starts with a pleasant drive hopping from one glacial valley to the next, within the boundaries of the Westland - Tai Poutini National Park. The Māori have a poetic legend to explain the presence of the glaciers in the area of the park. They say that once upon a time there was a beautiful girl named Hinehukatere that was living in the mountain. She and her lover Tawe used to climb the peaks until one tragic day he fell to his death. Hinehukatere cried for the loss of her love, and the glaciers we still see are her frozen tears. 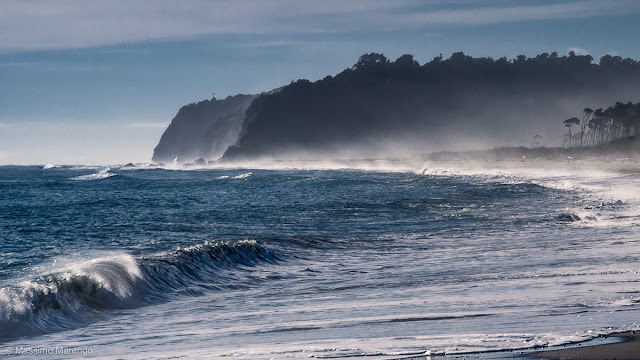 The area is known to the Māori as “Ka Roimata o Hinehukatere”: the tears of the avalanche girl. As we drove along Route 6, we suddenly entered into a native forest. The vegetation on this side of the island was quite different than on the Eastern side. The tidy rows of cultivated pine trees common on the Pacific coast were nowhere to be seen. Ancient trees contorted by the constant winds were prevalent, and made a thick canopy almost engulfing the road, winding as it followed the profile of the hidden coast. Even though it was a beautiful clear winter day, a thick mist exhaled from the forest and lingered on the road. Had we arrived in Fangorn? Well, I don’t know how many Ents there were on the forest, but at least the mist had a more mundane explanation, which became clear after a few miles, when the forests cleared opening the view: just to the right of the forest there lie the coast, roaring with the breaking waves just a few yards from the road. As you can see in the photo on top, the mist was not fog, but rather spray from the mighty waves. After two days of mountains, the coast was a welcomed new sight. We lingered there (the place is called Bruce Bay) for some time, until some annoying mosquitos decided that we were good enough for an impromptu meal. I don’t know if it was for the mosquitos, or maybe for the strength of the waves, but I was surprised that nobody was there, either sunbathing in the very long beach, or maybe riding the very long waves.